The Communication Foundation for Asia continues its efforts in supporting its valued clients through the use of training. Last November 15, 2014, the CFA Sales Head, Sean Herbert Siy, conducted PowerPoint training to 17 teachers from Nueva Ecija. The teachers came from three different schools, Vincentian Catholic School in Zaragoza, San Agustin Diocesan Academy in Jaen and St. Paul of San Antonio. The teachers rated the CFA speaker and facilitators highly. Fourteen photo enthusiasts ranging from amateurs to professionals honed their photography skills in the Awesome Photo Workshop held in CFA last June 28, 2014. Guiding them was Fr. Stephen Cuyos, MSC, an award-winning graphic artist who infected them with his passion for photography and influenced them to take photos that capture not only the eyes but also the soul. A participant applies rules in framing. Fr. Stephen tackled the basic rules in photography while relating them to life. Being a priest, he shared faith-based concepts and morals that inspired participants to take shots that deepened their spirituality. To further improve the shots, He also gave tips on photo enhancing and editing by using a free online photo-editing tool. The workshop ended with the participants producing professional looking photos and all were eager to practice their new photography skills. The next episodes on the Skillshare Series by the CFA Training Department will be about Social Media and the New Evangelization. On July 26, 2014 (Saturday), it will be on Creating Photostories for Evangelization. It will be held here at Communication Foundation for Asia. We all love taking photos. Photos not only allow us to record memories, feelings and ideas but also to tell visual stories. The process of making photos, and the photos themselves, bring revelations about who we are, about the world we live in, and about God. For its second Skillshare Series offering, CFA Training Department will conduct the Awesome Photo Workshop, designed for people wishing to explore faith and spirituality through photography. The workshop will be a process of discovery and enrichment. Participants will learn the basics of photography and image editing in order for them to create evocative and meaningful pictures. Shooting and editing photos as well as group discussions during the Workshop will redefine the way you look at some aspects of life. 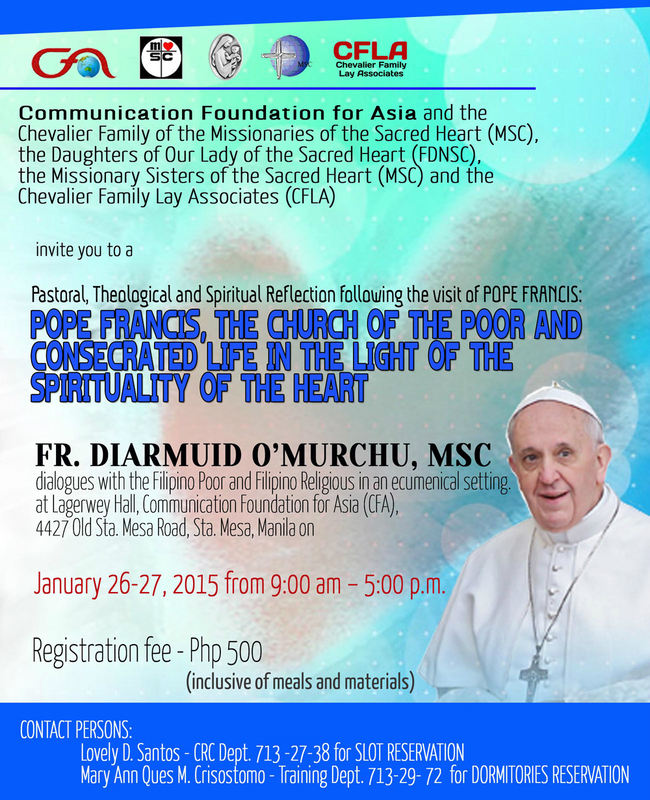 Facilitating the whole-day seminar is Fr. Stephen Cuyos, MSC. His photographs are the expression of his passion for life and commitment to God. His eye has developed through years of exploring faith and spirituality through photography. Many of his photos are showcased at http://www.flickr.com/photos/stephencuyos. The Workshop is scheduled on June 28, 2014, Saturday, from 9:00am to 4:00pm at the CFA Seminar Room in Sta. Mesa, Manila. Seminar fee per participant is PHP 1,500, which includes meals and materials. To fully take advantage of the workshop, please bring your own digital camera and laptop for the hands-on exercises. For reservations, please follow this link: http://goo.gl/R2Kce9. Creating Awesome Presentations is Awesome! Last May 16, 2014 CFA Training held the workshop Creating Awesome Presentations (C.A.P.) here at Communication Foundation for Asia. It is the first of the Skillshare Media Workshop Series which is a monthly workshop on various media skills for educators, catechists, trainers and students. The head facilitator Fr. Stephen Cuyos, MSC taught the participants how to create clear, effective and captivating multimedia presentations. The new techniques in adding images and text revolutionized how presentations can be created. One of the participants said that the highlight of the activity was when, “Learning how to use the tools to make my presentations more effective. As Fr. Stephen mentioned, it’s not as difficult as it seems.” Participants can’t wait to show and present their improved presentations using new techniques.